Drivemode is a driving app with a “no look” interface that allows you to focus on the road ahead, not your phone, while accessing music, navigation, calls, texts and more. The beauty of Drivemode is that it works in any car, eliminating the need for a pricey upgrade, and it is free. When you are in driving mode, it works with your navigation apps, like Google Maps and Waze and your music apps, like Spotify and Google Music Player. With Drive mode, it is easy to do things like change songs, update your destination and make or accept calls using only broad swipes and taps. As you get used to it, you would be able to use the app without looking at the screen. The driving mode utilizes a combination of voice narration, bright colors and large animation to let you use your phone screen using only your peripheral vision. It especially works well when you have a car mount or car dock on your dashboard, but those are not required. ★ Simple music control- just swipe and tap. Drive mode works with your favorite apps, like Waze, Google Maps, Pandora and Spotify. 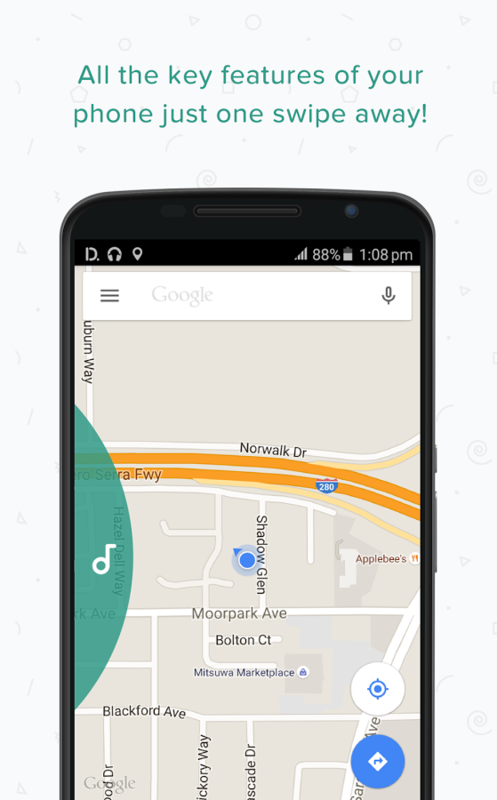 ★ Make and answer calls without blocking your navigation with driving mode. ★ Learns about you to recommend a destination or person to contact, before you need to dig through your phone to find it.